I've been pretty busy the past week trying to de-clutter my house in order to put it on the real estate market. My house is usually neat and clean, but I have to admit I've accumulated a lot in the 36 years I've lived here! This is just one of the many bookcases in my home, as I and my family are avid readers. Yes, those record albums on the bottom shelf that we've never had the heart to dispose of, and a Funk and Wagnall's Encyclopedia set that we bought when we were first married, that I'm sure is very outdated. I've actually weeded through this bookcase once already, disposing of an entire shelf of my nursing school textbooks from decades ago, and novels that we've read, but I replaced them all with cookbooks that were in my kitchen. Obviously, I will have to do lots more work on this bookcase along with three other bookcases in my home. I also found out I collect way too many periodicals and information booklets and recipes ripped from magazines or printed off the internet. I've lost count of all the bags full of recycling that I've put out for the NYC Sanitation Department! We found out Best Buy will accept electrical items such as TV's, computers with the hard drives removed, DVD players, cell phones, etc., for free recycling at their stores. They also have bins in their lobby where you can leave printer cartridges, CD's, Batteries, etc. You can read a list of their FAQ's on this link. Now I'd love if you, dear reader, can give me some moving tips! Once all the basement, attic and garage clutter is gone what do we do next? How do you prepare a home for showing? Did you stage your house? Put things in storage? Where did you find moving boxes and reputable long distance moving companies? How did you pare down your furniture and possessions? Do you have packing tips? Although this is a lot of work and we know we have a few more months of work ahead until we pack, we are very excited about our upcoming move to Colorado and the new chapter in our lives. Thanks for all your friendship and help as we embark on this new adventure! 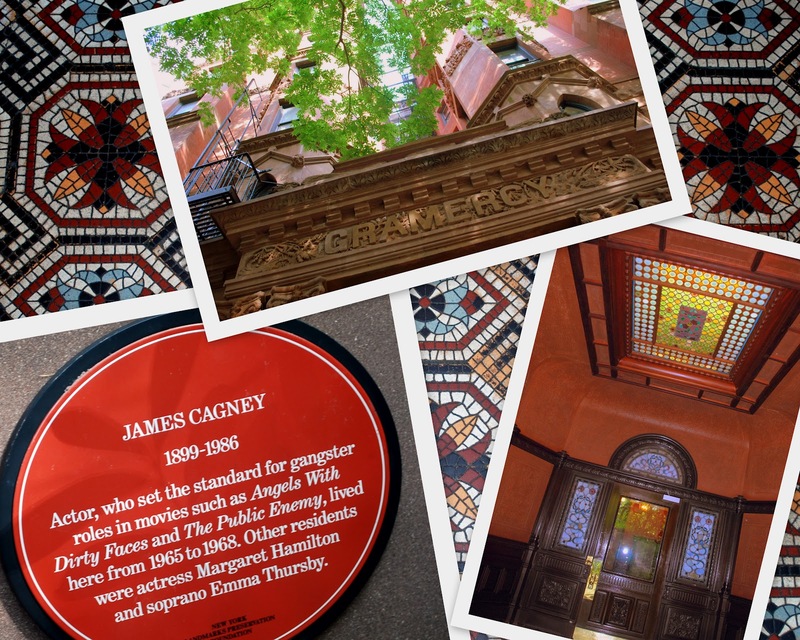 My husband and I went to dinner with friends a couple weeks ago at a restaurant located next to Gramercy Park in Manhattan, and I thought you'd enjoy seeing a few photos of this beautiful and unusual park, and the opulent neighborhood that surrounds it. The statue in the middle of the park is of Edwin Thomas Booth, a famous actor of the time, and considered by some theatrical historians as the greatest in the role of Shakespeare's Hamlet. However, he is usually remembered today only as the brother of John Wilkes Booth, the man who assassinated President Abraham Lincoln. The park is lush, verdant, and peacefully quiet. It would be a perfect place to bring a book and sit on one of the benches and read. The grounds are beautiful and well maintained. At only two acres large, it is the anchoring oasis of this exclusive neighborhood. The park is entirely encircled by this tall wrought iron fence with locked gates! Yes, this is a private park! All of my photos were taken by my shooting through the fence posts. Since 1831 only residents of surrounding buildings are able to buy keys that allow them admission to the park. This sign on the fence tells the entire story of the park and surrounding area. Many of the buildings surrounding the park are remarkable in style. The Players Club is on the left, and The National Arts club is on the right. 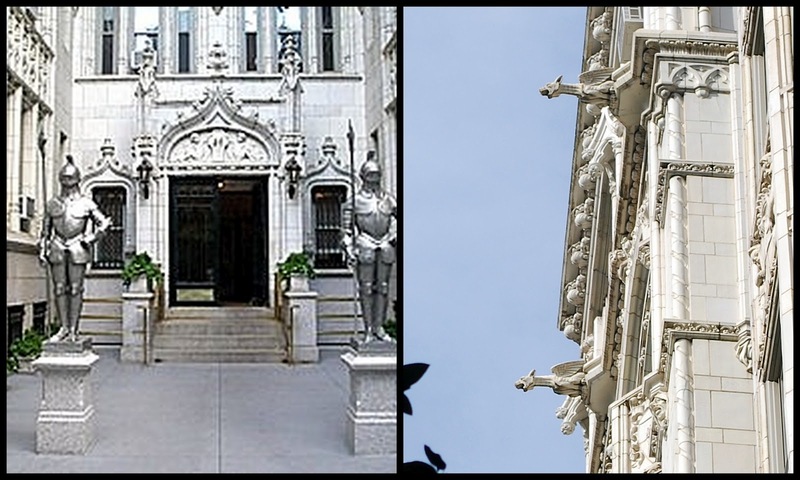 The Players Club is a social club founded by the noted 19th-century Shakespearean actor Edwin Booth, who purchased in 1847 a mansion located at 16 Gramercy Park. During his lifetime, he reserved an upper floor for his home, turning the rest of the building over to the private membership clubhouse. Its interior and part of its exterior were designed by architect Stanford White. The Players still maintains its entryway gaslights, among the few remaining examples in New York City. 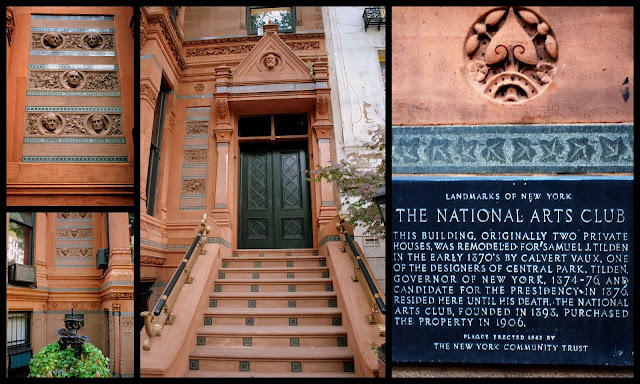 The National Arts Club next door was founded in 1898 by Charles Dekay, an art and literary critic of The New York Times to "stimulate, foster, and promote public interest in the arts and to educate the American people in the fine arts." The architectural details of the building are so interesting to see. The history of the building can be read in the photo collage above. It was the home to many famous people as you can see by the plaque on its exterior wall. I peeked into the luxurious foyer, and the beautiful tile floor is the background of my photo collage above. One of these elegant 18th-century townhouses was the residence of James Harper, publisher and former mayor of New York City. 4 Gramercy Park West was his residency from 1847 until his death in 1849. The intricate cast iron verandas date back to 1848. 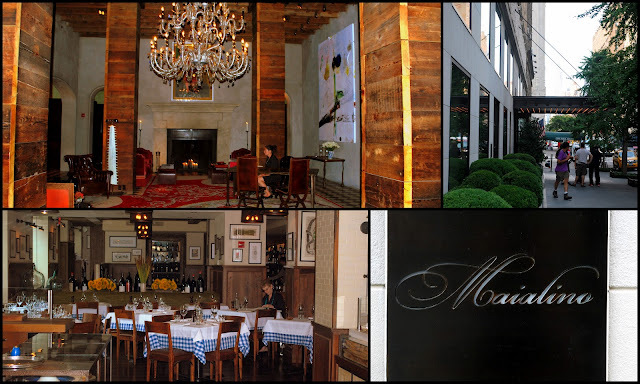 We ended our walk around Gramercy Park by entering The Gramercy Hotel where we dined at Maialino. Maialino New York is a new Roman-style trattoria from award-winning Danny Meyer’s Union Square Hospitality Group. It serves lovingly prepared Roman-style cooking from Executive Chef Nick Anderer. You can see the menus on this link. Our meal was fantastic! The portions were generous and we had sample portions of different kinds of pasta as our appetizers as the selection was so enticing. We could see why Maialino is such a popular restaurant and I highly recommend it! 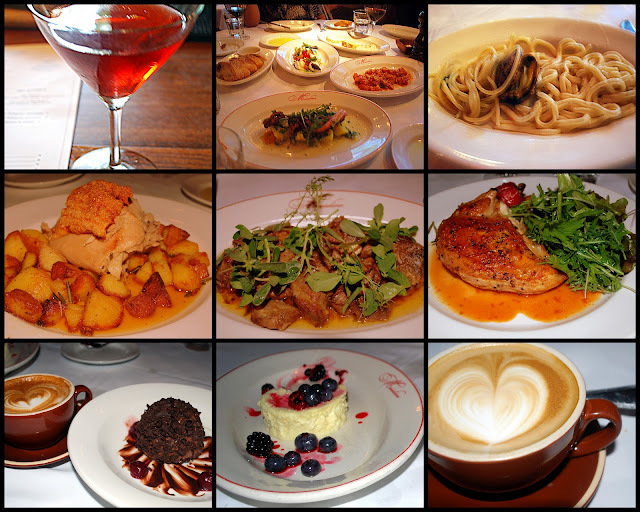 One of the best bargains in New York City is the bi-annual event called "Restaurant Week," where participating restaurants offer a price-fixe of $24.07 for select lunch and $35 for a select dinner menu. This very popular event is held every summer and winter, with hundreds of top New York City restaurants participating. Reservations fill up fast so I usually go to the event web site and give my e-mail to be put on the notification list of when the event will be held and call for reservations right away. It is a wonderful way to dine affordably at some of the city's top restaurants! 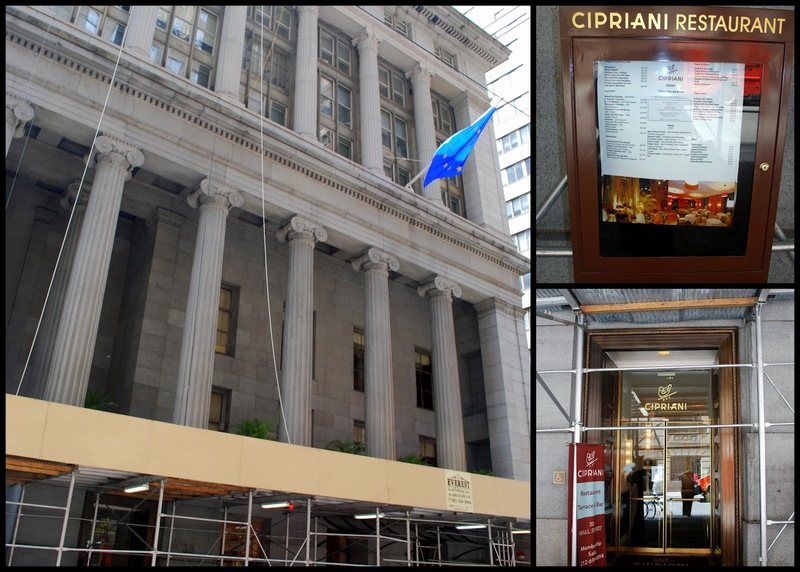 Since my husband works in Lower Manhattan near Wall Street (the NYSE -- New York Stock Exchange -- is seen in the photo above) we decided to visit Cipriani Club 55 located at 55 Wall Street, between William and Hanover Streets, one of the five different Cipriani restaurants in Manhattan. The National Historic Landmark building of 55 Wall Street is a former bank building that today houses luxury apartments. Initially constructed between 1836 -1842, the building has a long and interesting history. It served as the home of the New York Merchants Exchange, the New York Stock Exchange, the United States Customs House, and the headquarters of the National City Bank. Unfortunately, there was scaffold around the building, so the entrance to the restaurant was slightly obscured in these photos. There is a law in NYC that after a certain amount of years, every building over a certain height has to have scaffold erected and the facade has to then be examined for any loose masonry, etc., to prevent potential injury to pedestrians. Because of this, you'll often find buildings with scaffold around them in New York. It is ugly, but a necessary, precaution. The Cipriani Club 55 Restaurant is located on the second floor of the building (use the exquisite marble stairs or take the elevator), but there are display cases in the lobby that you should look at first, to see some beautiful, and expensive, Italian leather objects that are for sale in the lobby store. 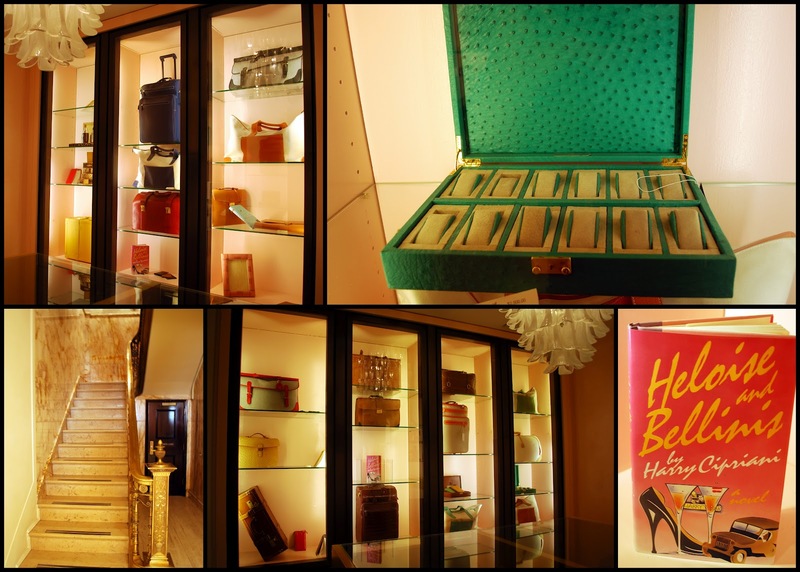 The green leather watch case in the upper right was priced at $2,500! If the Cipriani name sounds familiar, it may be that you remember that in 1931 Giuseppe Cipriani opened the doors to Harry's Bar in a stone building along a canal just off Piazza San Marco in Venice. There he created the world renown drink called The Bellini, composed of the juice of white peaches and Italian Prosecco wine. It is absolutely delicious! For our luncheon meal, my husband and I chose the same appetizer -- Tuna Carpaccio with Tomato and Avocado (photo upper left). 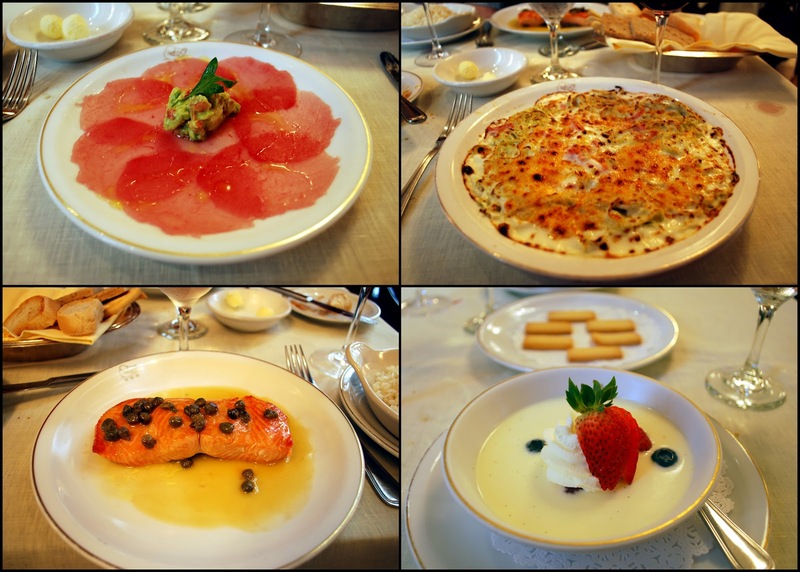 I had the Baked Green Tagliolini with Ham as my entree (photo top right), and my husband chose the Salmon with Lemon and Capers, served with rice pilaf on the side (photo bottom left). Our little secret? We eat half of our entrees and then switch plates with each other so we get to try both! We both had the Vanilla Panna Cotta with Mixed Berries for dessert (photo bottom right). From the fine linen tablecloth and napkins, beautiful, gold-rimmed monogrammed china, and heavy silverware, the presentation was rich and elegant. The food was utterly fabulous and we felt the portions were very generous, especially the divine Panna Cotta! After lunch, my husband walked back to his job while I stayed in the area. I always wave "hello" to my favorite president, George Washington, as I pass by Federal Hall. If you'd like to learn more about this very interesting building in the Wall Street area you can read a post I wrote about it here. On this day I visited this interesting museum located nearby -- a future blog post for another day! PS: Thank you to all who commented on my good news! I really appreciate your support and best wishes! It's time for Vee's Note Card Party again, my selection of photos this moth are from my May 5th post about going to brunch in the New Leaf Restaurant in Fort Tyron Park in Manhattan this past spring. I hope you read all of my GOOD NEWS in my post yesterday! THANK YOU to all for your congratulations and best wishes! It was also such a relief to hear that you will find my blog as interesting coming from Colorado as you did from New York! I have made so many wonderful friends through blogging and it will be so nice to have you follow my journey west! Can a woman who has lived her whole 59 years of life on the same block in Brooklyn, New York and in the same house for 36 years move with ease? Will I adjust to high altitude cooking, wild animals strolling through my yard, freeway speeds of 75 miles an hour, and a lack of public transportation after years of bus and subway use? Will I find opera, theater, museums, unique restaurants, places of interest and the diversity I was so used to enjoying in New York City? Time will tell! ....our two adorable grandsons who live in Colorado, I think I will happily adjust! Please go to Vee's blog A Haven For Vee to see her pretty note card photos and links to all the blog participating in this fun monthly event! 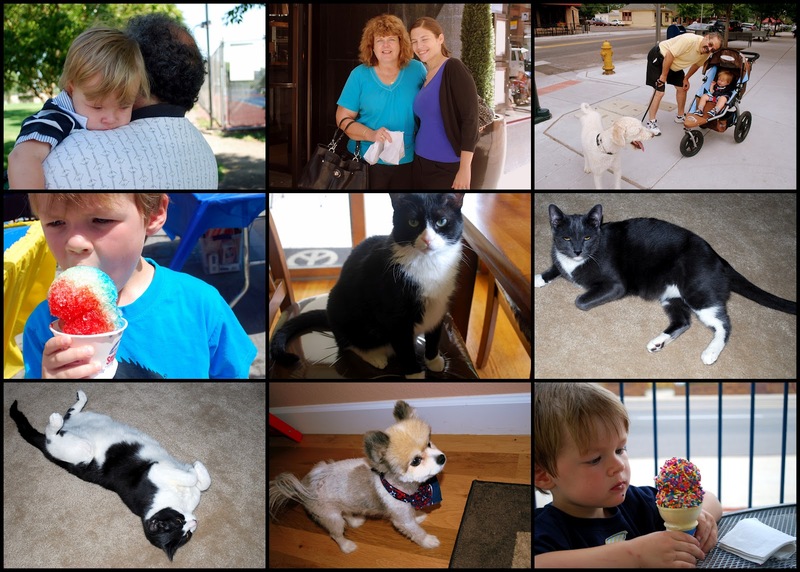 I am also adding this post to Beverly's weekly Pink Saturday blog event! My Good News...but will you still love me? When my husband and I finally arrived in Colorado after driving for almost three days cross country from New York City, we were so happy and relieved! We always did this trip by flying but this time we were bringing our daughter's long over-do bridal shower and wedding gifts out to her. We stayed at my daughter and son-in-law's house for the week, as they have a very comfortable guest room in their suburban home. 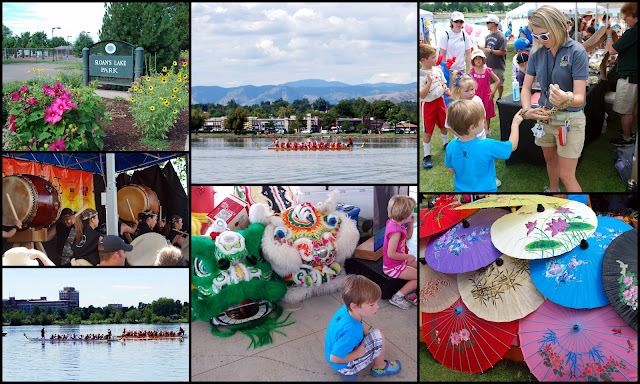 We were able to attend the colorful annual 2012 Dragon Boat Festival at Sloan Lake in Denver, where my older grandson was brave enough to pet a snake from the Denver Zoo. 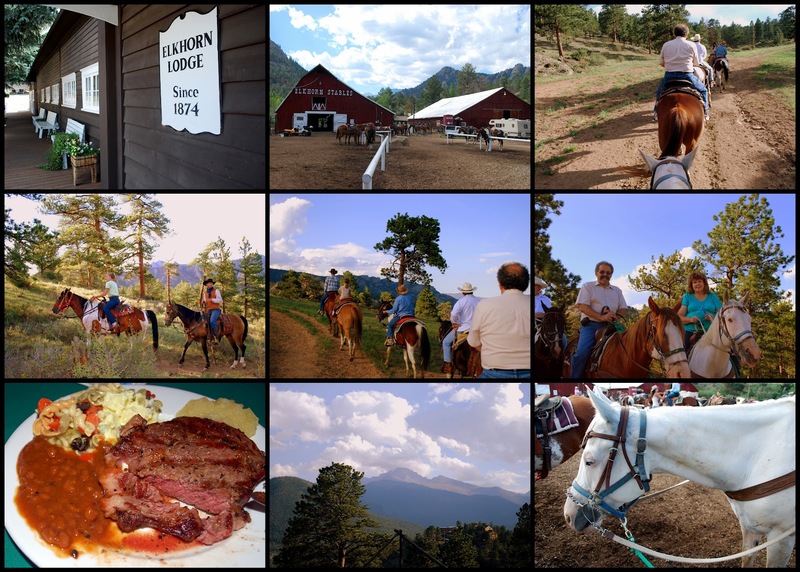 My daughter treated her father and me to a couple of hours of horseback riding followed by a chuck wagon steak dinner at the historic Elkhorn Lodge in beautiful Estes Park! The Elkhorn Lodge was established in 1874 and is the oldest continually occupied building in Colorado! Our horses climbed a trail up small foothill mountain and we had beautiful views of the larger Rocky Mountains along the way. When I was a little girl I loved to watch Roy Rogers and Dale Evans, The Annie Oakley Show, Rin Tin Tin, Zorro, The Lone Ranger....all the wild west TV shows of the time. My first ambition was to become a cowgirl, and on this trip, it came true for a few hours, and it was fun! My daughter and son-in-law holding their expected baby's sonogram photos! Yes, their first child and my third grandchild is due in February! We are so happy and excited and feel very blessed! Which, of course, leads to my subject question.....will you still love me and visit my little blog in the future if I am no longer blogging about my life in New York City? I hope so! I still have lots more to blog about NYC until I do move and most likely I will be returning frequently to visit family and friends here so I will have a bi-city blog for a while afterward. My life ahead will be certainly exciting! Follow my blog on facebook! I Tweet! Do you? Please Follow Me! Hello and welcome! I'm Pat, a lifelong New Yorker who has recently moved to a suburb of Denver in the beautiful state of Colorado, so that I can live close to my children and grandchildren. I look forward to learning many new things about my new "mile high" city and I will share them on my blog. New York City will always be my second home, and I will also continue to share many posts about it. My blog's name in Italian means a "Thousand Favorite Flowers." I chose this unusual blog name because researching and writing for my blog, and taking photogrpahs for it, is like another "memory flower" that I am collecting in my bouquet of life. I hope you will enjoy your visit to my blog and that you will leave a comment so that I know you've been here. Thanks! Permission is needed for photo or content use. Unless indicated, all photos and writings are my personal property and can not be used or reproduced without my written permission. My e-mail address is available in my profile. Thank you very much! I was named by Time.com as one of the 30 top pinners to follow on Pinterest! My Blog Followers -- Thank you for your interest and friendship! I was uplifted above a world of love, hate, and storms of passion, for I was calm amidst the eternal silences, bathing in the living blue. For peace rested that one bright day on the mountaintop. ~ Isabella Bird "A Lady's Life in the Rocky Mountains"
1998 - 2013 I still miss those I loved who are no longer with me, but I find I am grateful for having loved them. The gratitude has finally conquered the loss.